M. K. Bhadrakumar in his article reproduced below, courtesy to Indian Punchline.com summarises all Indians residents’ concerns over the current goings-on in the countries of the Gulf. 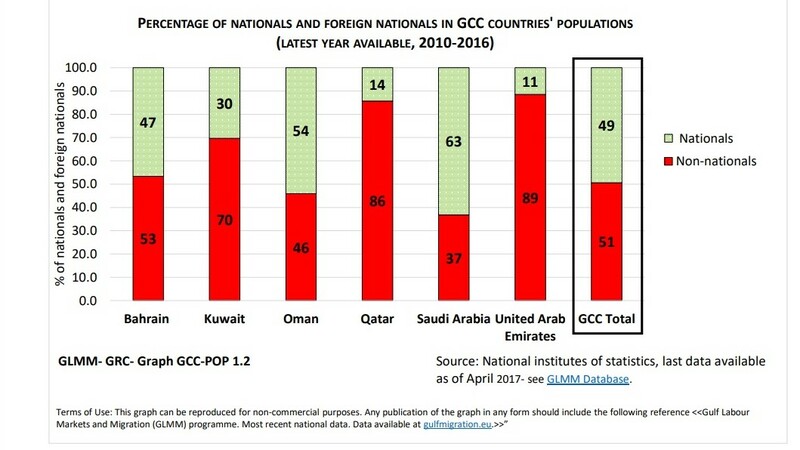 As a majority if not the highest per cent (refer graph below) of non-national residents, can only watch and meditate while witnessing a Gulf within GCC forever widening gets more and more obvious. He said, “The members of the Gulf Cooperation Council are keen that the crisis with Qatar will have no impact on the Council (GCC). But this does not mean relinquishing the conditions imposed on Qatar.” Doha should stop supporting terrorism and extremism and avoid interfering in other countries’ affairs and needed to fulfil the Arabcountries’ conditions to open the way for its return to the full-fledged work in the GCC. “The stance towards Qatar came to push it to change its policies,” he added.